Becherovka Original, as we currently know it, is an outcome of Jan Becher”s passion and enthusiasm completely devoting himself to making his dreams come true. 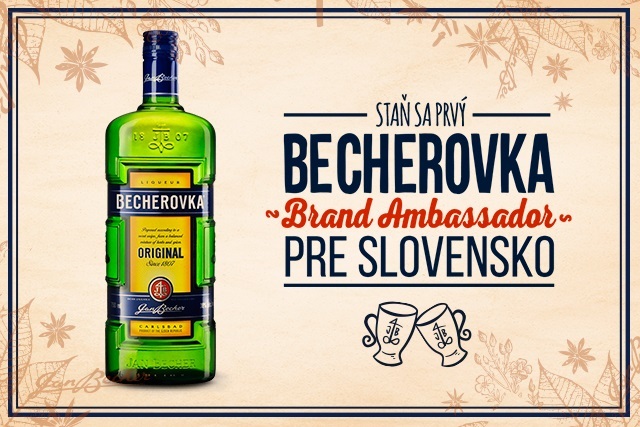 Becherovka Original, as we currently know it, is an outcome of Jan Becher”s passion and enthusiasm completely devoting himself to making his dreams come true. He was always ready to go the extra mile, think outside the box and whatever he came up with, mostly hit the ground running. He kept amazing people by catching them off-guard since he was confident that only eagerness and dedication would lead to extraordinary results. Constantly craving something new, exceptional and unique, placed him head and shoulders above his time. Becherovka and the legendary green bottle were his brainchild, the very bottle that is so recognizable these days and the very spirit that brought him fame all around the world. Since Jan Becher”s message is just as tangible in every bottle as it has ever been, we put a lot of thought to it and have made a decision to select a unique person to raise further awareness of the brand in Slovakia using his/her unprecedented passion and excitement to inspire Slovaks. We are looking for a candidate who will embark on a mission to strengthen the reputation of this well-known and popular liquor, since we are convinced that a personal touch with fans is the most effective and down-to-earth way to communicate ideas. The ideal candidate has got a knack for marketing, he/she goes beyond the call of duty when it comes to organizing and coordinating events, but most importantly he/she gets the the job done with passion and enthusiasm. It is our way among others, to continue in our strategy already set, to rejuvenate our brand including bonding with consumers and generating brand loyalty. Our intention is to intensify emotions and the way the brand is perceived in general.